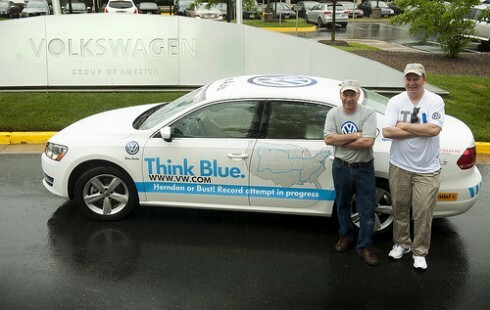 Drivers Wayne Gerdes and Bob Winger set a new Guinness World Record for lowest fuel consumption by a non-hybrid during their 8,000-mile trek across 48 states in a 2013 Volkswagen Passat TDI Clean Diesel. Gerdes, a practiced “hypermiler” who runs the online community CleanMPG, and his co-pilot Winger averaged nearly 78 miles per gallon during their 17-day trip ending Sunday. That’s 10 mpg better than the previous record of 67.9 mpg, and about 13 mpg better than the hybrid record of 64.6. For comparison, the EPA estimated that the average Passat TDI driver might get 43 mpg on highways. The only noted modification was a set of Continental low rolling resistance tires, according to a VW spokesman.